To the "North Wales Motorway!" "One Wales -Connecting The Nation!" 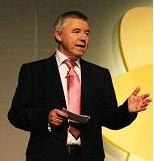 Welsh Minister for Transport announces major review of ALL transport policies! Click for details..
"We ...need to work with the people of Wales if we are to improve the overall quality of life and opportunities without damaging the environment that we all value" ...Ieuan Wyn Jones April 2008. ...it's back to the drawing board as Assembly Minister ditches controversial A494 highway scheme. Inquiry inspector says a big "NO" to plans ...and Welsh Transport Minister agrees! Press report here. requires "Acrobat Reader" + a bit of patience! [BMA Wales are ....] "currently in the process of drafting the legislation which would enable Wales to put Health Impact Assessments in planning applications for schemes like the A55 road improvement [Ewloe to Northop phase] on a statutory basis" Thank you Dr Lewis! Ieuan Wyn Jones says "NO!" "There was virtually no political support for the development that was planned"
North Wales AMs at Cardiff showing solidarity against the format of Transport Wales proposals for the A494 "Motorway". 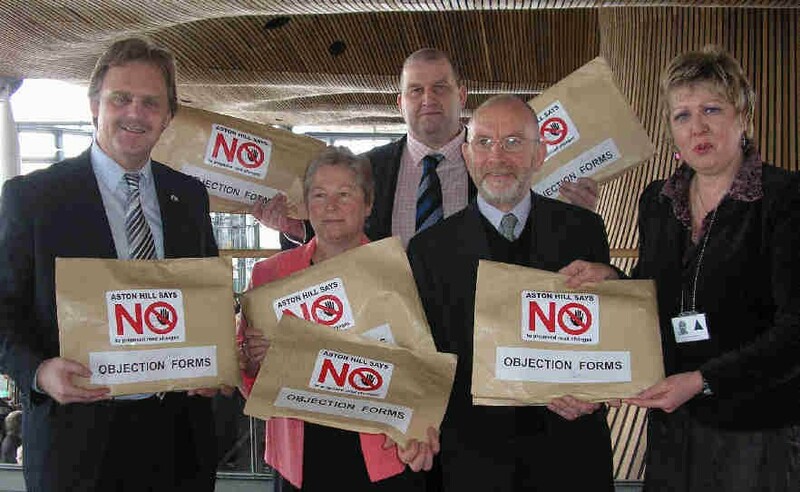 Mark Isherwood, Sandy Mewies, Carl Sargeant, Eleanor Burnham -handover petition documents to at Assembly. Also, thanks for much appreciated research and vocal support from AMs, Janet Ryder AM and Brynle Williams. A BIG THANK YOU to North Wales AM's! "This is a time when we can look forward to a great future for our railways. Devolution helps us deliver because we now have unprecedented powers to plan and implement a 21st century rail service for Wales, and develop a first-class, integrated transport system vital for a vibrant Welsh economy as well as a greener world." ...Welsh Assembly Government Former Transport Minister Andrew Davies. If YOU share our concerns about ANY plans by officials at Transport Wales to push through any large-scale proposals for yet more polluting tarmac and concrete whilst they -and our local authorities- do nothing to appraise the long-term health of our young folk from the consequences, then PLEASE contact your local councillors, MPs and Assembly Members NOW -and let them know just how you feel! This site is now read and quoted throughout the English (and Welsh!) speaking world! It represents a SINGLE-ISSUE of community concern and has no party-specific affiliation. The content is for the benefit of ALL the ordinary folk who live in and love this wonderful land -and who want to see North Wales and its peace-loving, law-abiding "Gogs", remain a healthy, place for generations yet to be born. Aston Hill Says NO! "Coalition-Group"
Who we are -and what do we do? This website is dedicated to all the ordinary people of North Wales who believe that any proposals make the A494/A55 highway into a full-blown motorway are ill-considered and dangerous at a time of widespread concern for a sustainable future. In April 2006, residents of Flintshire, first became aware of extensive plans by Transport Wales to augment local roads in a way that would, ultimately, drive a high-speed superhighway through a thriving and attractive part of North Wales. Local communities quickly reacted to the threat. Today, they are collectively known as the "Aston Hill Says NO!" coalition. 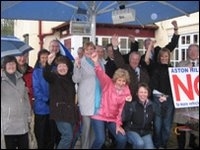 This informal group of ordinary folk, supported by councillors and a remarkable spread of National and Welsh Assembly politicians, have been united in their opposition to anything that would make the A494 Queensferry to Ewloe and connected dual carriageways into a virtual "motorway". The TW proposals would have made a local road, effectively eleven lanes wide in parts -and would have triggered the lifting of the existing 50mph speed constraint. We believe, that at a time of increasing concern for sustainability and effects of climate change, there can be no justification constructing, yet more massive highways. Any short-term relieve would be lost as more traffic was induced and future generations would be pay a heavy price in loss of amenity and traffic pollution in, what at present is a lovely part of Britain. From the outset, Transport Wales has admitted that their proposals will INCREASE CO2 emissions by 14% -yet they still refer to them as an "Improvement". Thousands of concerned folk disagree. Along the A494/A55 corridor, groups of like-minded residents are now coming together with one aim; to bring about a TRANSPARENT, comprehensive review of ALL the transport options for North Wales. Until that time, Transport Wales is assured of concerted local opposition to any large-scale development of the existing A494/A55 road scheme. From the outset, common purpose, social cohesion and collaboration made possible by ground-breaking use of email and internet resources that are free to all, have been the mainstays of sustaining an effective campaign. By employing a strategy of promoting sections of linked schemes as individual "improvements", Transport Wales has concealed the true extent of its plans. Recent disclosures of connected schemes now show that their true intent is to impose, what is effectively a "motorway", on the whole of the A494/A55 North Wales trunk road. In the guise of the "Welsh Assembly Government", officials, not accountable to the electorate, have pushed road-building agendas that paid scant regard to the best aspirations of our politicians and the well-being of communities along the route. Many residents consider that they have been denied fair and open consultation -and that their basic human rights have been compromised. There has been little discussion or consultation about "big-picture" road-transport objectives -or any realistic appraisal of changes in public attitudes to alternative transport options. Despite concerns that the proposed work would bring the disruptive effects of heavy traffic and air-pollution close to several sensitive areas -including schools, retirement homes and a hospital- officials have consistently refused to submit their proposals to an implicit human, "Health Impact Assessment". Correspondence obtained by objectors under new "Freedom Of Information" and released at the month-long Public Inquiry, showed that The Office Of The Chief Medical Officer was effectively influenced by Transport Wales in respect of clinical appraisals and possible implications for other highway schemes being planned for Wales. Data released only in January 2008 by the Department for Transport has pitifully under-estimated future fuel costs and the implications for likely car use and traffic growth. The official premise for projected growth that has been the basis of much of the proposer's case must surely now be considered to be seriously flawed. What have the objectors achieved so far? Concerns about the scale and nature of the proposals by North Wales Assembly Members and over 2,300 individual letters of objection resulted in an extensive Local Public Inquiry chaired by an independent professional Inspector of national reputation & standing. The inspector's findings and recommendations and the consequent decision by the Assembly Transport Minister, were published 26 March 2008 and resulted in the proposals being unreservedly rejected! At the highest levels of the Welsh Assembly Government there is now the realisation that further augmentation of road transport in Wales is a political "hot-topic" -and one that, unless issues of justification, consultation and transparency are addressed, will blight the whole ethos of the Assembly. What sort of support have we experienced from established politicians? In addition to the invited participation of various agencies of our Local Authority, we have sought and got the commitment and dedicated support from many local councillors. Ordinary people have written to the press and DEMANDED that those who have undertaken to represent the best interests of the community, should nail their colours to the mast. The public appeal to common sense and purpose met with political support, often vigorously expressed, by numerous elected members of our National Assembly and UK Parliament, regardless of party affiliation. How do we gain campaign awareness and retain public interest? We have developed our own, simple website. Content is provided by volunteer, amateur community scribes and it is hosted by a free-to-all international web provider available to anyone. This is it. We have encouraged dozens of ordinary people to send letters to the press and make themselves available for local radio/TV comment. We have made our own YouTube commentaries and held several light-hearted (if noisy!) public demonstrations. Our campaign has been heard around the world! It has featured on radio stations throughout Wales, UK and North America. The results of our efforts to make Health Impact Assessment (HIA) an implicit feature of all proposals such as this have been the subject of a government sponsored, Downing Street petition and are at the present being closely followed as far afield as Australia/New Zealand. The health objectives of our campaign have been been supported by local GPs and Pharmacists, and clinical experts including BMA (Wales) and world-renowned UK Royal Commissioner, Prof Stephen Holgate. We have an extensive new-media archive of interviews with politicians, councillors and dozens of ordinary folk. We have audio/video records made at numerous public meetings -including a complete record of the Local Public Inquiry. This material is at present being compiled for future reference and historical interest and will be deposited at the National Library of Wales in due course. Similar "motorway" schemes -connecting westwards to the present- are planned for North Wales roads. Residents, at this moment are preparing to foster vigorous opposition to all of them. We are willing to pass on the benefit of our experiences with all who share our concerns. Since mid 2006, ordinary folk in North Wales have learned much about how to concert a lawful and successful opposition to further needless road building. We remain watchful -but we are confident and optimistic that our endeavours HAVE had impact -and made a difference. We hope that the modest success of our campaign might give comfort and encouragement to any who share our concerns.